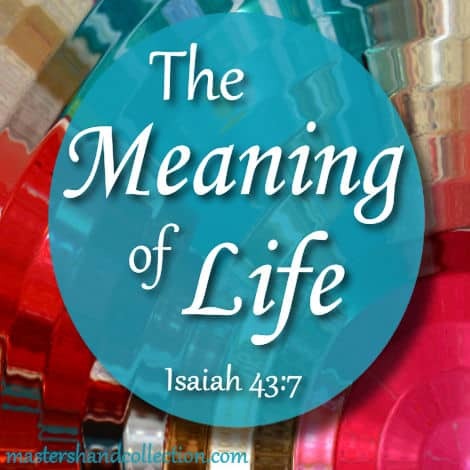 Last week we discussed, “What is the Meaning of Life?” People have searched for the answer to this question since the beginning of time. They are hoping to find a meaning to all of the chaos we face. They mistakenly believe that if they can answer this one question, then all of their problems will fade away. As Christians we know that God gives us the answer in His Word. It’s surprisingly simple, yet powerful. If you missed last week’s post, you can read it here. 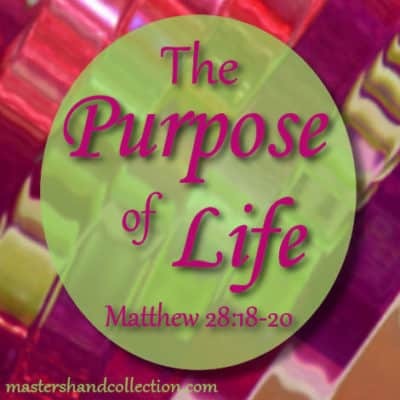 This week, I’d like to take the discussion one step further and look at the Purpose of a Christian’s life. Because we are followers of Jesus our purpose is different from the rest of the world. While most people are working hard to buy expensive possessions or rack up their 401k, we are called to achieve a more important goal. This passage of Scripture we all know as “The Great Commission”. But what does it mean in our lives right now? This verse is our purpose and our calling as Christians. It is a commandment from our Savior about how we should be living every day. Within this one commandment there are three distinct points about the purpose we have been given, and how we are to grow God’s kingdom. Some of us will have the opportunity to serve God in foreign countries. But most of us will serve God here in our own country. We don’t have to go to a far off land to follow the Great Commission. Wherever we are, and whatever we are doing it is our responsibility to tell people about Jesus. We can’t leave it to chance that someone else will do it for us. God puts us where He wants us to be and we can win souls for Him right here in our own backyards. All we have to do is look around us and we will see that there are so many people who are already in our lives that need Jesus. Whether it is our calling to serve God at home or abroad, we have been given the power of the Holy Spirit to fulfill our purpose to make disciples. Baptism is an outward showing of our faith. It is a symbol of Christ’s death, burial and resurrection. Being baptized doesn’t save us, instead it shows the world that we are changed and have a new life in Jesus. When someone is saved, the next step is baptism. We need to make sure that we following Christ’s command to baptize people in the name of the Father, the Son and the Holy Spirit once they have received Jesus as their Savior. As always, Jesus is our example. He was baptized by John the Baptist and in doing so, fulfilled God’s will. It came to pass in those days that Jesus came from Nazareth of Galilee, and was baptized by John in the Jordan. And immediately, coming up from the water, He saw the heavens parting and the Spirit descending upon Him like a dove. Then a voice came from heaven, You are My beloved Son, in whom I am well pleased. Once someone that we have witnessed to is “saved”, our job isn’t over. They need to be taught the Bible and about how to have a personal relationship with Jesus. I’m very grateful for all of the wonderful people who poured their knowledge of Jesus into my young mind while I was growing up. Of course, my parents, but also many Sunday School teachers, VBS workers, Deacons and friends. They invested in my life and discipled me along the way. Now it’s our turn to be the teacher. All of the things we learned, probably many years ago, God tells us to teach to the new Christians in our lives. Jesus spent time, one on one, with people. He taught them all that God wanted them to know. He is our example of how to be a teacher, and how to invest in the lives of the people around us. Just as He gave His knowledge to the twelve disciples, we must pass on our knowledge to the people that we have witnessed. Then one day they will be ready to teach all that they have learned to the next batch of new Christians. While other people are worried about their place in life, we can rest easy. Our loving Heavenly Father has given us the answers the most pressing questions we face. What is the meaning of life? Why are we here? And what is our purpose? We now know that we were created for His glory and our purpose is to share Him with everyone we meet. I’m so excited to bring this post to you this week! And I hope that it will encourage you, as you go out into your personal mission field, wherever that may be! There are so many people in our lives who are lost and need Jesus. I pray that you will be able to show them Christ’s love. May the God of hope guide you as you fulfill the Great Commission! Again, if you missed the first part in this series “What is the Meaning of Life?” you can find it here. For a Christian the answer is very obvious. God doesn’t leave us in suspense. He tells us, in His Word, exactly why we were created. 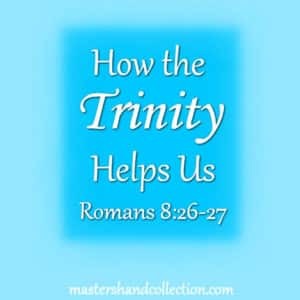 So the simple answer is this, we were made for God’s glory! We were put on this earth not for our own glory, but to bring glory to the One who created us. How do we bring glory to God? Let’s take a look at a few verses that tell us some of the ways we can glorify Him. If we want to bring glory to God then the first thing we need to do is to praise Him. It’s easy to praise God when life is good. But sometimes praising God is the last thing in world that we want to do. Maybe times are tough and things aren’t going so great in our lives. But God doesn’t ask us to praise Him only in the good times. When we praise God, in good times and in bad, we bring glory to Him. No matter what our current circumstances are, we can rest assured that when we praise the God who made us for His glory, He will lift us up. #2 Live our lives in a way that pleases God. The way that we conduct ourselves can either bring glory to God or dishonor to His name. The world is watching us to see how Christians react. Most of us probably don’t think about if we are bringing glory to God when we are at work or school or wherever we are spending our time. It’s not really about what we are doing at these places, it’s if the people around us can see that there is something different about us. Do they see Jesus when they look at us? Or do we act just like the rest of the world? Sometimes I live up to that standard and sometimes I fail. But what’s important is to keep trying to set an example of why we are different. And that brings us to the last verse I’d like to look at today. #3 Let your light shine. I’m sure there is an unsaved person in your life that you know is watching you. They ask questions that they think you can’t answer or they point out the things that you do wrong and say, see they aren’t so perfect after all. We all have a few of those people in our lives and it’s our job as believers to shine our light in a way that shows them Jesus. I have people in my life like this too and I want so badly to show them the Savior. 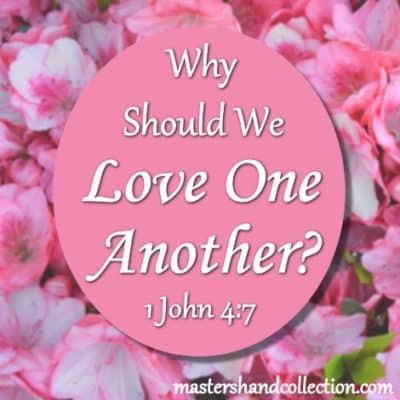 I try to be a good example of Christ’s love, but somehow I always leave feeling like I said or did the wrong thing. I wonder if I’ll ever get it right. But it’s a humble reminder that I am living my life not for myself but for Jesus, and whatever I say or do should bring glory to our Father in heaven. We no longer need to ask the question, what is the meaning of life? If we are saved, then we already have the answer. So, let’s start living our lives to glorify God. He will surely bless us for it!